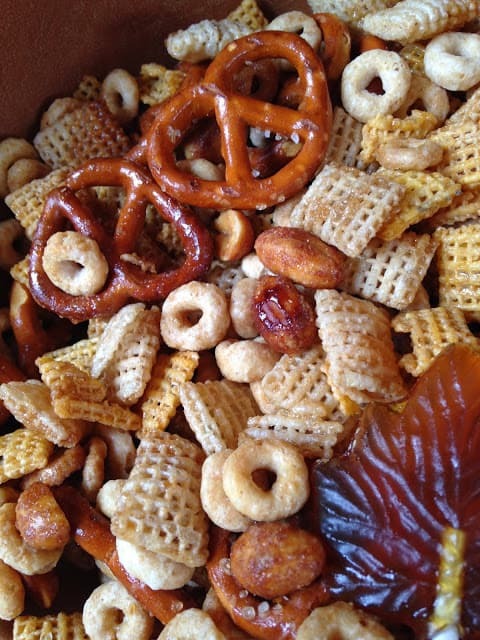 Maple Glazed Snack Mix is tasty delicious, salty sweet with a hint of maple. It’s the perfect blend of sweet and salty. 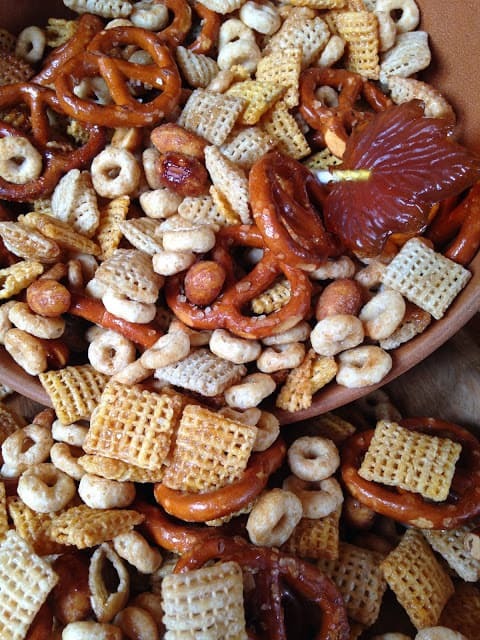 Maple glazed snack mix is made with pretzels, chex cereal, honey-nut cereal, and honey-roasted peanuts. A mixture of maple syrup, butter and vanilla extract is combined and then drizzled over the pretzels, cereals and nuts and baked into a delicious snack. When making this recipe or any recipe that calls for using maple syrup always, always use the real thing. Maple flavored syrup and commercial pancake syrup doesn’t even contain any maple syrup. Most contain only corn syrup with the added flavoring of maple. 100 % real maple syrup is made with maple syrup that is tapped from maple trees and has the maple taste you want. Another clue that is the real deal, maple syrup isn’t thick. 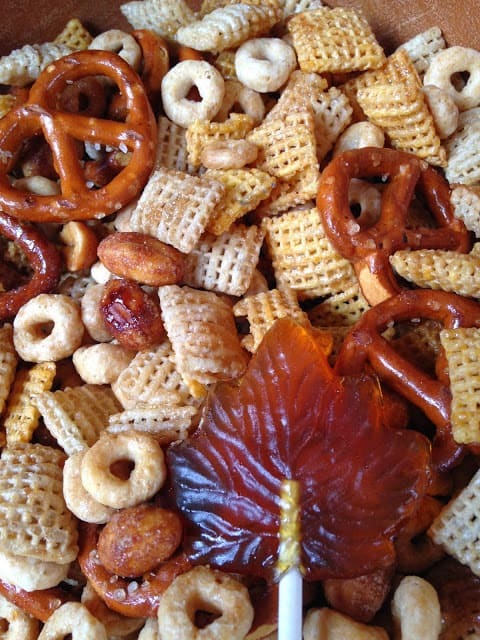 Looking for more Snack Mixes? You’ll sure to love these favorites. Peanut Butter Chocolate Delight and Chex’icago Mix. In a large bowl combine cereals, pretzels, and peanuts. In a small microwave safe bowl, combine maple syrup and butter. Cover and microwave on high for 45 seconds or until butter is melted. Stir in extract. Pour over cereal mixture and toss to coat. Transfer to two 15 x 10 x 1 inch baking pans, coated with cooking spray. Bake at 250º for 45 minutes, stirring every 15 minutes. Remove from oven; cool. Stir in m & m candies. Store mixture in a air-tight container. *Add More deliciousness to this recipe by adding one of the new m & m flavors to take this snack mix to even greater taste sensations. *Time-Saving Tip: Cut down on prep time by using frozen chopped onions. This sounds like a wonderful sweet and salty snack! Thanks for sharing at Simple Supper Tuesday. I think I would like this salty/sweet mix more than the traditional chex mix. Something about the maple glaze speaks to me. Thank you for sharing, Lynn. Hope you have a nice week. The 2 Maple Syrup producer member over at Cindy's Recipe Exchange would LOVE this "mix", Lynn. Thanks for sharing.